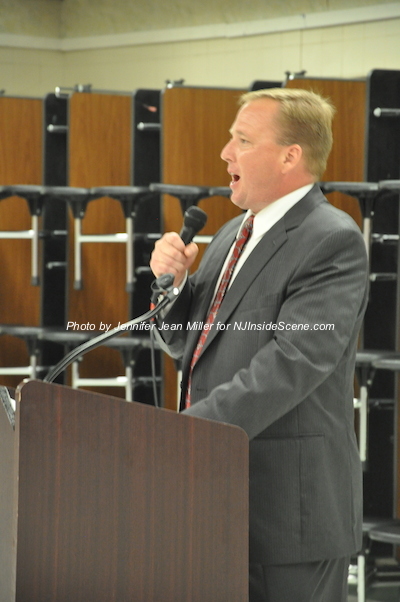 Jerry Scanlan is the new chair of the Sussex County Republican Committee. Photo by Jennifer Jean Miller. 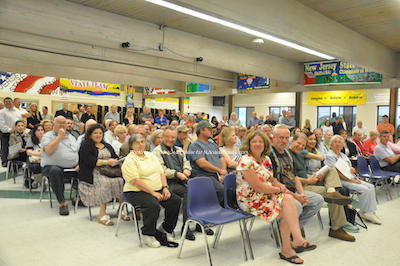 SPARTA, NJ – The Sussex County Technical School cafeteria was a standing room only experience on Tuesday night, June 30 when the Sussex County Republican Committee convened to choose a new chair. The event came on the eve of Governor Chris Christie’s announcement that he is seeking a Presidential run, with many of the members having trekked to Livingston to support Christie in his announcement. Jill Space, a GOP State Representative who headed up Tuesday’s meeting as acting chair and explained the voting process to the members proudly held up her “Christie 2016” sign at the event. The process, Space explained, entailed introduction of the chair selection by Space, who has been acting chair. From there, nominations were taken from the floor, followed with candidate speeches. Space then called a 10-minute break for a time when committee members could speak to the individual candidates. After that time, the votes were submitted and then counted. Sussex County Clerk Jeff Parrott, the committee’s attorney and others were part of the vote count. After the votes were counted, the new chair was announced and had time to address the audience. The two nominees were Jerry Scanlan and Donald Ploetner II. Jerry Scanlan at the podium. Photo by Jennifer Jean Miller. Donald Ploetner speaks to the group. Photo by Jennifer Jean Miller. For Scanlan, who ended up carrying the vote 97 votes to Ploetner’s 61, Hopatcong Mayor Sylvia Petillo gave Scanlan’s nomination, with Bea Rush offering the second. Petillo acknowledged the volunteer efforts of both Scanlan and Ploetner for the party, noting when she has thought of the qualities of the next leader for the chair, as someone who has been someone that she has described as a “capable and effective leader,” her choice has been Scanlan. Donald Ploetner, one of the nominees for the GOP chair. Photo by Jennifer Jean Miller. Marple said that he had the opportunity to speak to both Scanlan and Ploetner and what stood out about Plotener was his quest to seeking out input from the members as how to unify members. 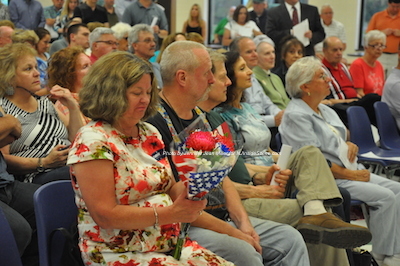 Additionally, members were greeted with a letter from Kelly Ann Art of Hardyston District 7. 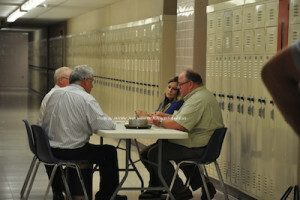 Hart asked Scanlan and Ploetner both questions about their stance on various issues. While Scanlan offered a brief answer to both questions on pro life and the Second Amendment (noting he was pro both) he asked to meet and speak with her one on one and did not reply to her other questions. Ploetner answered her other questions (he said he is also pro life and pro Second Amendment) that pertained to illegal immigration (against it), property taxes and fair school funding (Ploetner said that funding needs to be equally distributed throughout New Jersey, while monies are going to the Abbott districts), he said he is an advocate for traditional marriage, Ploetner said e is against crony capitalism and against bailouts such as the one involving solar in the county, and also noted he is against the Common Core. The group listens to the candidates. Photo by Jennifer Jean Miller. Both candidates had the opportunity to speak and both thanked outgoing chair Ailish Hambel for her service. Jill Space presented Hambel with a bouquet on behalf of the committee. Ailish Hambel who stepped down as chair on June 10 eyes up flowers that were presented to her for her service. Photo by Jennifer Jean Miller. 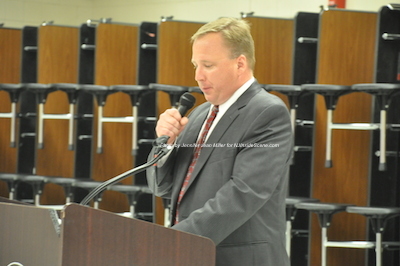 Following the coin toss, which Scanlan was the winner of, Scanlan explained his involvement and volunteer efforts with the party. Scanlan is a Hopatcong resident who has worked in the corporate sector for 25 years and is an employee of Alcatel-Lucent. In a letter he sent to committee members, he said he planned to leverage his relationships formed and to participate in many NJGOP events. He sid he believes in fundraising coming from the grassroots level, and that the group needs to be more focused and goal-oriented. Among Scanlan’s other involvements, he is the vice chair of the Sussex County Community College trustees, he is involved with the Hopatcong Republican Club, he is a member of Hopatcong’s Environmental Commission, he has served as an alternate member for the Hopatcong Planning Board, and he is an officer on the Sparta Knights of Columbus. He is also involved with the Boy Scouts and had been an Eagle Scout. 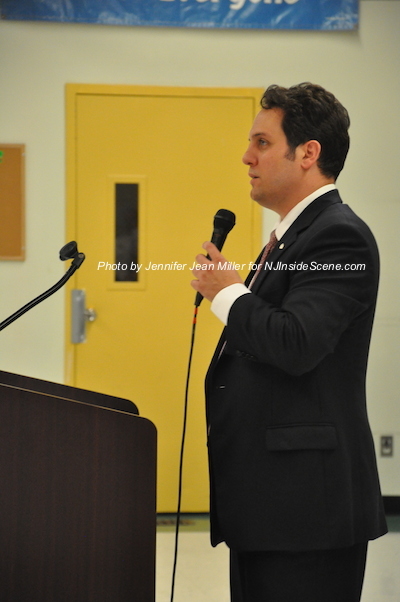 Scanlan said that he was a co-coordinator for the Christie Gubernatorial Campaign for Sussex County in 2013. Acting chair Jill Space guides members through the voting process. Photo by Jennifer Jean Miller. 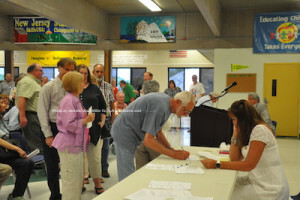 Members lining up to vote for the new chair. Photo by Jennifer Jean Miller. Scanlan said it is important to look to the future of the party and to especially encourage young Republicans in the group. Ploetner, like Scanlan, has served on the committee’s executive board. He has been involved with organizing the GOP booth at the New Jersey State Fair. He is involved with the Branchville Rotary Club and is an elected member of the National Chris Craft Antique Boat Club. Ploetner has worked in the automotive industry and now runs his own concierge business, I-Deal Acquisitions. He is a Sparta resident. Ploetner offered to set realistic goals and action plans and also advocated fundraising. He said he planned a “GOTV” (Get Out and Vote) campaign. He also described himself as an “independent voice” that does not hold special interests. 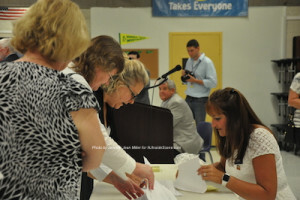 The team counting the votes for the Sussex County Republican Committee GOP Chair seat. Photo by Jennifer Jean Miller. 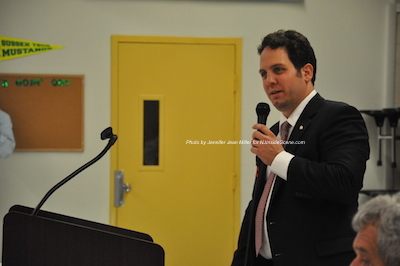 Scanlan quickly took to the podium after taking the vote and said that it was necessary to put together a measureable plan for the future of the party. 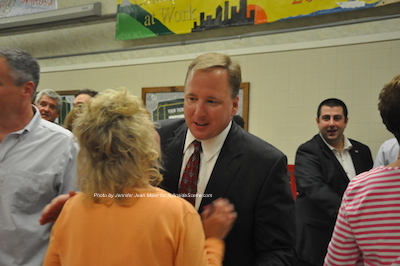 Jerry Scanlan receives congratulations from members of the committee as the group adjourned. Here he is with Hopatcong Councilwoman Marie Galate. Photo by Jennifer Jean Miller. Both Scanlan and Ploetner received praise from fellow members of the party after the vote and as members departed the meeting.